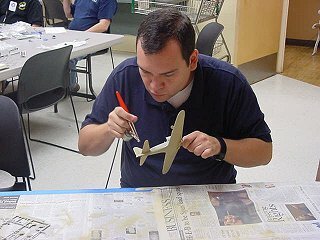 The primary goal of this course is to “Teach The Basics” to adult modelers either new to the hobby or returning after a long absence. The ABC course also provides a powerful and proven tool to attract membership to the local Chapter and IPMS/USA. When the student completes the course he/she should have a clear understanding of what is involved in research, building, and finishing a model. First, a note about class size. The number of students does not determine a successful class. If you have one or ten students you will have accomplished the same goal, advancing the hobby and increasing membership in the club and IPMS. For example if you had 2 students per class twice a year, you would realize 4 new members, multiply by 3 years and your membership has increased by 12 members. Review your club Membership Records; has it increased by 12 over the last three years? And that’s at only 2 students per class! To properly present this course you must find a facility that will allow you to present 6 consecutive classes on the same day and time to keep continuity. This is critical. Other factors to consider include sufficient lighting, cleanup requirements, and permission from the facility to airbrush. Your choice of model must be the same for all students from the same manufacturer allowing you to write a step-by-step instruction manual to direct your students during each class. All the students must be at the same place in construction during each class according to your course outline. The course was primarily designed around the Tamiya 1/48 A6M2 Zero. You do not have to use this model, but bear in mind that the model you select must be of decent quality. Do not subject the beginner to an ill-fitting model, or one that is too complex, as this will re-enforce the perception that building is not that easy and certainly not fun. Prior to starting the course the instructors must first construct the model and record the steps needed for the class instruction manual. Take special care in noting the time constraints needed in drying time for glue, seam fillers, painting, decals, etc. and take into account that you are teaching inexperienced builders. You will almost certainly deviate from the manufacturer's assembly plans because of the time constraints discussed. When you are finished with the sample model and satisfied with the instruction booklet, have a club member construct another model under the instructor’s direction using the instruction booklet. This will allow you to correct any problem areas that may arise. Please do not hesitate to email me if you have comments about the ABC Class, or if you have suggestions for its improvement. This class has a proven track record of success in clubs in Florida and Texas, and has resulted in an increase in club membership, enthusiasm on the part of current club members, and the development of new and fresh leadership from the adult students. It is a win-win for all concerned.